In stimulating the Throat Chakra, it enhances our ability to communicate our inner truth. It also smooths and heals our Auric field by releasing negativity from our emotional, physical, intellectual & spiritual bodies. It was quite effective in opening the pathways for all Chakras to become balanced and energized. Quartz has a trigonal crystal system and is in the mineral class of oxides. It is formed in passages or hydrothermally in druses or clefts from a pure, silicic acid solution that contains no foreign substances. Free-growing crystals can vary from long and slender prisms to crusts or 'points'. There are usually six terminal faces that develop larger and smaller faces horizontally. Quartz can occur almost anywhere. Veins formed in high temperatures are usually coarsely crystalized. When formed in low temperature veins, in geodes and sedimentary rocks, we enjoy the finer grained varieties. Clear quartz veins have been guides to miners to find gold in many regions for many years. I imagine since it has been around Gold, even with man adding it to the Quartz in the lab, it's an energy that Quartz is familiar with and does not seem to mind the bonding. In fact, I'd have to say, it seems to rather enjoy it. I found meditating with this one a very relaxing as well as enlightening experience. In holding it, I did find it to be very soothing. As I wrestled with website coding, I found myself grabbing one when I became frustrated and it seemed to calm me down rather quickly. Aqua Aura Quartz is being referred to by many as a truly a `master' vibration crystal. It seems to effortlessly, but consciously channel spiritual wisdom to us by clearing and opening the pathways to our own spiritual enlightenment which helps connect us to our Spirit Guides. Aqua Aura Quartz is an effective aid at our emotional levels in that it seems to help us feel more at peace and to calm our emotions. Aqua Aura Quartz provides protection from psychic attacks and seems to help to clarify thought patterns making solutions to problems readily seen. 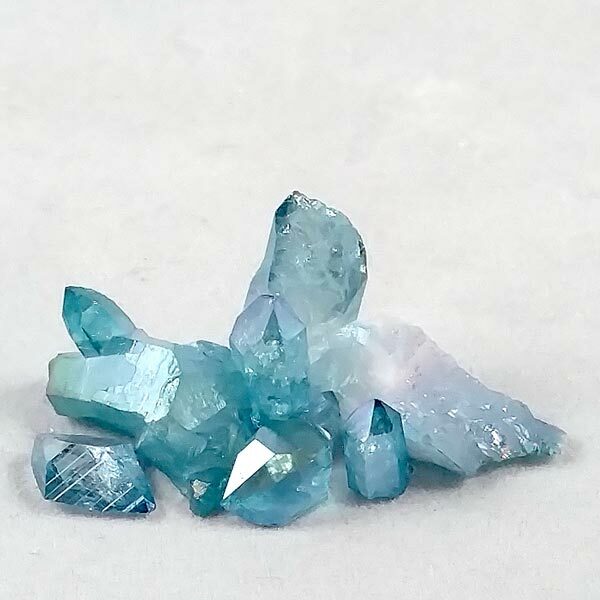 Aqua Aura Quartz assists in healing throat problems, stress-related illnesses, immune system deficiencies, and in moderating the thymus gland. Aqua Aura Quartz benefits all astrological signs. It has a Projective Energy, Element of Water and its Planet is the Moon. In doing my research on this one for folklore, I had to chuckle each time I came across someone saying its creation was a 'secret process which is part alchemy and part science.' Ummm, no. The process is, in reality, ALL science, and, it has a U.S. patent that was granted in February of 2006. Even if some may try to convince you that you are purchasing 'magic beans', this one is really pretty awesome to use on its own or to enhance other crystals. While they do carry a higher price tag than regular Quartz, keep in mind, you are actually paying for the Gold and the process and not for a 'Leonardo Da Vinci alchemy experiment'.